Unleashed imagination is a hell of a rare thing to find at the movies these days. “The Grand Budapest Hotel”, sure, but then what? 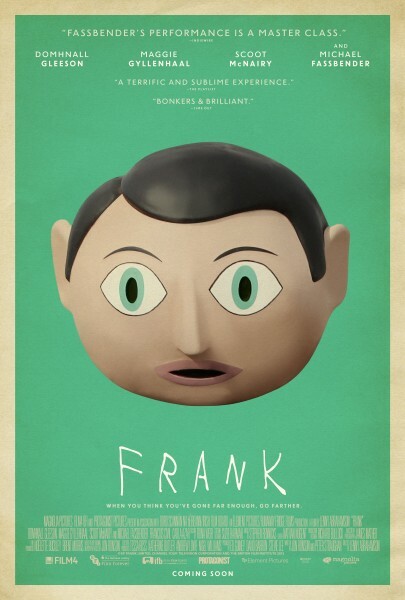 Try “Frank”, an offbeat comedy loosely based on the story of Frank Sidebottom, a Brit comic who enjoyed some underground success in the late 1980s and early 1990s by wearing a fake head with a cartoon face painted on it. Weirdo? Wait till you see this movie, directed by Lenny Abrahamson. Michael Fassbender (“Shame”, “Prometheus”, “12 Years a Slave”) gives a heroically funny and touching performance as Frank, an enigmatic musical genius who hides himself inside a large fake head. The story is entirely told from the perspective of Jon (Domhnall Gleeson), a wannabe musician who joins Frank’s band for 18 months to record an album that will “make” history. A first-rate supporting cast includes Maggie Gyllenhaal, Carla Azar (from the band Autolux) and Scoot McNairy, who make the most of screenwriters Jon Ronson and Peter Straughan’s clever material. It’s no shock that Fassbender’s character turns out to be more intriguing than anyone anticipates…or that the actor seems to be having a great time playing him. It’s a killer role, and Fassbender nails it. Not many actors can accomplish that with a large fake head, which is why this movie is so welcome. “Frank” will spin your head around and then smoothly work its way into your heart. Allow it.